Dawn Scarfe’s work includes site specific installation, performance and field recording. It uses resonating glass instruments to explore interferences between the senses and help ‘tune into’ ephemeral aspects of our surroundings. Her ‘Listening Glasses’ stratify the sound of urban streets into musical tones. ‘Lenses’ and ‘Tuning to Spheres’ use wine glasses as resonators to re-sound audio from small speakers. 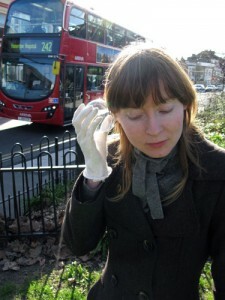 She is currently artist in residence with Forestry Commission England and Sound and Music. Recent exhibitions include ZKM Karlsruhe, TONSPUR Vienna; La Casa Encendida, Madrid and Café Oto, London. She has a PhD in Sonic Arts from Goldsmiths University.